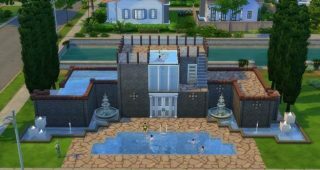 I’ve been playing with my Sims family – Amanda and Ty Page, and Marcus Lundy (Amanda’s brother), when I noticed Ty had a Whim to buy a pool. He’s a lover of the outdoors so it made perfect sense to add a pool to their home! Here’s a bit of their story. Being a big keyboard user, to access “pools” sort in Build Mode I hit F3 to shortcut my way in, and clicked on the pools button to begin planning my layout. 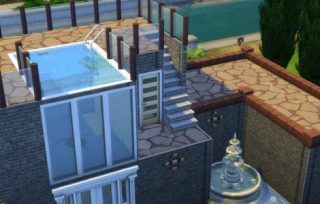 I didn’t have much room on the ground floor, having built out a bunch of fountains and foliage to spruce up the home, but adding a rooftop pool was more than doable! To unveil the latest addition to their home, Ty invited over family and friends to celebrate. Nephews, nieces, aunts and good friend all showed up, including Marcus…gloomy and snobbish as always. Ty loved food, and thought a full stomach would break Marcus from his gloomy demeanor, so he began grilling hot dogs for the whole crowd. This didn’t go well. 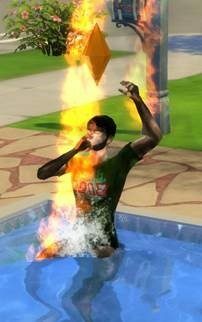 Marcus was “helping” at the grill and suddenly burst into flames! Fortunately for him, he was near the pool. He jumped in and quickly extinguished the flames, but not before a little uncomfortable singeing. The party was over, but Ty and Amanda’s love for pools didn’t falter. And it was time to add more pools! A pool was added to the second story because it just felt right, and the front fountain was converted into an in-ground Pool for the family – a big hit! Now that would be the end of this pools story, but it wouldn’t be complete without mentioning the accident. Marcus was swimming alone in the rooftop pool and found that a few walls had suddenly closed off his exit. The construction project had been known to the family but apparently someone forgot to tell Marcus. Without an exit, Marcus swam until he was too tired and then… well he’s a ghost now, wary of the water, which suits Ty just fine, as now he can spend some alone time with Amanda by the pool.